How much is Louis Zamperini Worth? Louis Zamperini Net Worth: Louis Zamperini was an American prisoner of war survivor, Olympic distance runner, and inspirational speaker who had a net worth of $1 million. Louis Zamperini was born in Olean, New York in January 1917 and passed away in July 2014. Zamperini's experiences inspired the best-selling book Unbroken: A World War II Story of Survival, Resilience, and Redemption which was written by Laura Hillenbrand in 2010. The book was adapted into the movie Unbroken which will be released in December 2014. Louis competed in the 1936 Olympics 5000-meter race and finished 8th. He joined the United States Army Air Forces in 1941 and became a second lieutenant. Zamperini was deployed to the Pacific Island of Funafuti on the B-24 Liberator bomber Super Man. While on a search his plane crashed into the ocean and killed eight of the eleven men on board. He and two other survivors reached the Marshall Islands and were captured by the Japanese Navy and held as prisoners of war. A year and a half after he disappeared he was returned home. He received many awards including a Purple Heart, Prison of War Medal, and World War II Victory Medal. 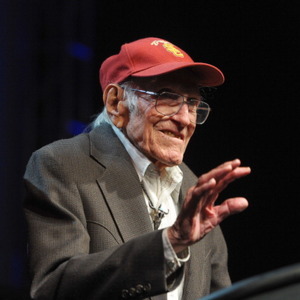 Louis Zamperini passed away on July 2, 2014 at 97 years old.